Barnes-Jewish Hospital in St. Louis, Missouri, is affiliated with the Siteman Cancer Center and Washington University School of Medicine. With the growing number of cancer survivors in the United States and around the world, supportive care has become of even greater importance for these patients. A novel fixed-dose combination of netupitant and palonosetron, referred to as NEPA, was found to be highly effective in preventing chemotherapy-induced nausea and vomiting in 2 studies presented at the 2013 American Society of Clinical Oncology (ASCO) Annual Meeting. I do not think my situation is unique. I live in a large city with horrendous healthcare. If you do not live in such a city, you may not believe that I live in the United States. I do. Most of you, I imagine, live in places—urban, suburban, or rural—similar to mine. Hopefully, because you have not been seriously ill, you do not know it. 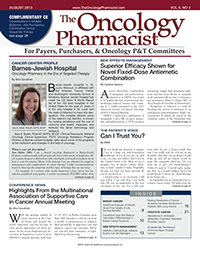 In this month’s issue of The Oncology Pharmacist, we present our coverage from the 2013 annual meetings of the Multinational Association of Supportive Care in Cancer (MASCC) and the American Society of Clinical Oncology (ASCO). Further analyses of Study 301, which compared eribulin to capecitabine in the treatment of advanced breast cancer, showed greater improvements in quality of life (QOL) with eribulin, and overall survival (OS) benefits in subsets of patients. While branded and generic enoxaparin share many traditional characteristics of low-molecular-weight heparins (LMWHs), they differ in several parameters that are relevant to an antithrombotic effect, according to researchers from Loyola University Medical Center, Maywood, Illinois, who presented their findings at the 54th Annual Meeting of the American Society of Hematology. Breast cancer survivors who suffer from depression can safely take both tamoxifen and a concomitant selective serotonin reuptake inhibitor (SSRI) antidepressant, according to a large population-based observational study presented at the 2013 annual meeting of the MultinationalAssociation of Supportive Care in Cancer. Dermatologic adverse events are frequently reported in patients treated with epidermal growth factor receptor (EGFR) tyrosine kinase inhibitors (TKIs), dual EGFR/human epidermal growth factor receptor 2 (HER2) blockers, and ErbB family blockers.